WHAT HAPPENED: The Orange started by outscoring the Big Red 14-2 through 5:52 of the first half and went into halftime up 23-12. Another 7-0 run early in the second half gave the Orange a 30-13 lead, and Cornell never was able to whittle the lead below 14 points the rest of the night. ANALYSIS: Syracuse fans were panicking a few weeks ago following a double-digit loss to St. John’s at home. But the Orange has improved its play since then, especially on the offensive end, where SU has rediscovered its shooting stroke. Though SU didn’t exactly fill it up from downtown (3-11), it shot 47 percent from the field and limited themselves to 14 turnovers. Meanwhile, the defense held the Big Red to 34 percent shooting from the field and 4-22 from downtown. The Big Red also turned the ball over 18 times. HERO: Rakeem Christmas was unstoppable in the paint. He was an efficient 9-12 from the field, and led the Orange in both points (19) and rebounds (9). 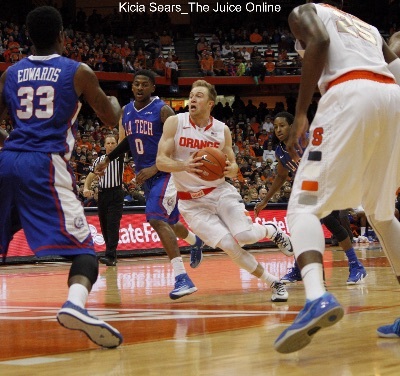 Trevor Cooney was right behind with 14 points, though he was just 4-12 from the field. The biggest cheers of the night came for walk-on Christian White, who buried a deep 3-pointer at the buzzer for the final points of the game. ZERO: While Cornell struggled as a team from the field, guard Robert Hatter had the toughest night. 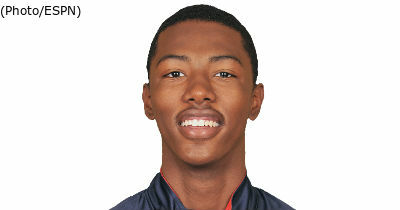 He was 1-10 from the field (1-8 from 3-point land), and also led the team with four turnovers. For SU, Chris McCullough was quiet again, with just six points on 3-4 shooting, though he chipped in seven rebounds. WHAT’S NEXT: Syracuse opens conference play at Virginia Tech on Jan. 3 at noon. The Hokies are part of a seven game stretch against non-ranked ACC teams that will allow SU to ease into the ACC. TV: ACC Regional Sports Network.